While children learn their alphabet in school with the usual help of “A” is for Apple – anyone with an Airedale in their home knows that Airedales have their own version of the “Alphabet”. 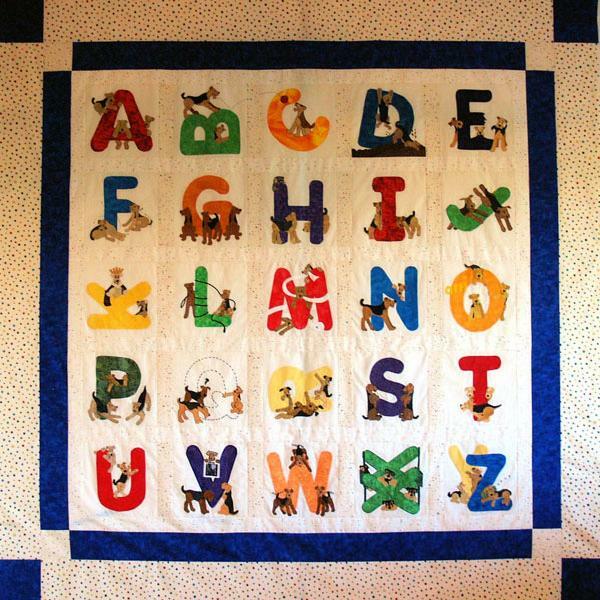 Alphabet quilts have been created throughout history with many themes – birds, flowers, animals, babies, school blocks and scores of others. But the ladies in the Bee felt that an Airedale’s take on an alphabet quilt would surely be very different with that great sense of humor, fun and devil-may-care attitude… so we proudly offer you a truly beautiful art quilt, made with love, pride and incredible talent! Click on the quilt or here to check out this NAR Fundraising Art Quilt. We already have our tickets; when is the Pennies for Airedales drive starting? Sadly, thanks to various statutes, laws and legislation, online fundraisers such as Pennies for Airedales are no longer legal. Pennies, despite its immense popularity and value to AireCanada’s rescued dogs, is gone for good. In its place, we hope to interest you in a new look for our online store — shopping cart ease, better payment options and lots of new stock, some of it one of a kind and very collectible. Other fundraising options will be available, as well, to help the Airedales that need new homes. Watch this blog and the AireCanada home page as well as various Airedale forums and Facebook for announcements!